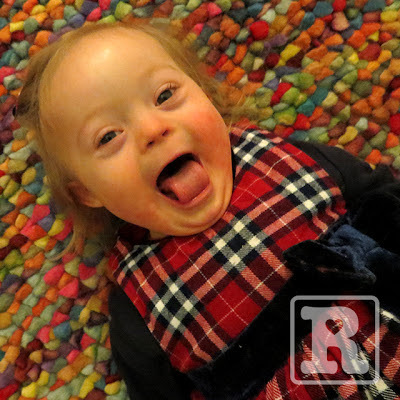 It's been a while since the last post about Rosie as I've been wrapped up in the festivities and the more recent not-so-exciting return to work. I did contemplate sharing a post about our Christmas but decided I would keep this one to myself, it was such a special time for us celebrating altogether for the first time and truth be told I'd struggle to do it justice with my basic writing skills! Having been thoroughly spoiled by everyone, the year started with plenty of new toys for Rosie which in turn has brought fresh challenges. 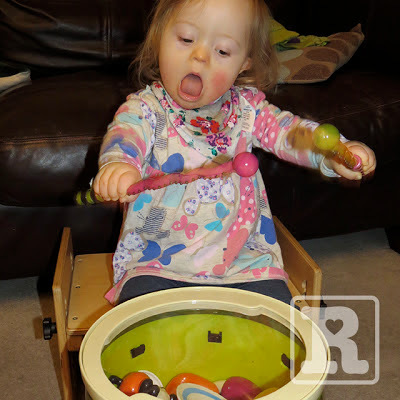 One of her favourites is a drum – she loves the sound of the banging and puts a lot of effort into ensuring a good contact is made thus maximising our headaches! It's quite a large drum in comparison to Rosie and requires her to be sat slightly higher which ties in perfectly with the chair/stool supplied by her physio before Christmas. The movement used to bang the drum so energetically from a seated position means she's putting extra weight on the top of her legs and using muscles to counter balance without really realising. 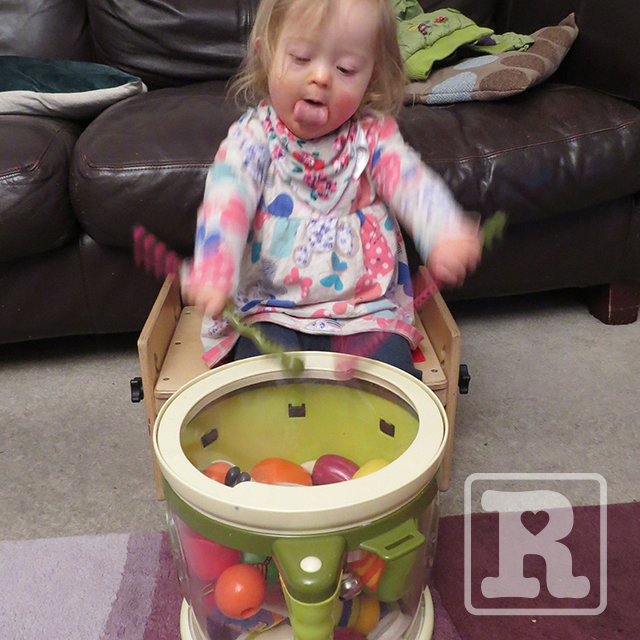 Playing with the drum has also shown a mini step forward in her co-ordination as she now manages to hold and hammer both drumsticks without dropping them. I'm not sure how best to describe the next toy other than calling it a 'helter skelter giraffe type thingy'. 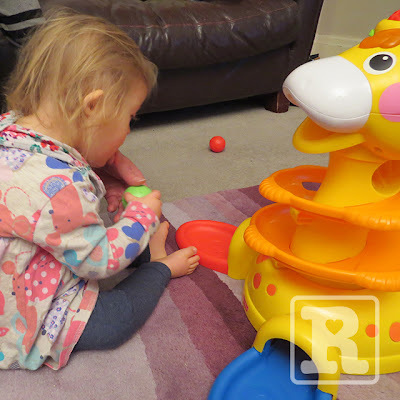 The idea is to pick up the different coloured balls and place them in the Giraffe's mouth and watch them spin around it's neck back to the bottom whilst it makes one of those noises that only childrens toys can, you know – the type that drives you crazy after two goes. 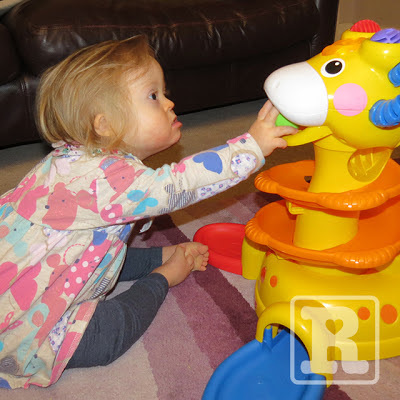 After much brotherly encouragement she is now able to pick up the balls and place them unaided into the giraffe's mouth. and quite rightly gives herself a clap at the end too! Watching the three of them play together is brilliant and it's moments like these I really treasure knowing they won't last forever. I realise it's no revelation but Rosie, as with many younger siblings really does pick things up quicker with the boys encouragement as she loves to copy them. 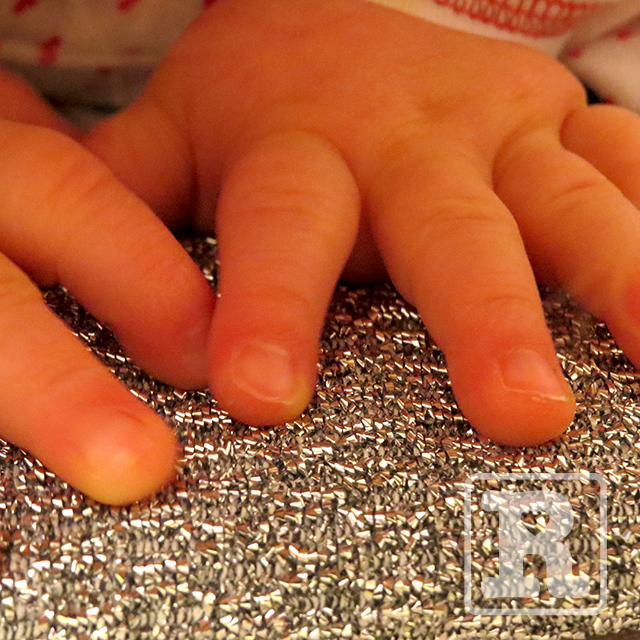 A tad random I know, however Karen had taken her to a sensory session once and within the box of items to explore was one of these and she absolutely loved it, it sparkles and has a rough texture which keeps her entertained for ages and will stand her in good stead for when she's old enough to wash the pots! 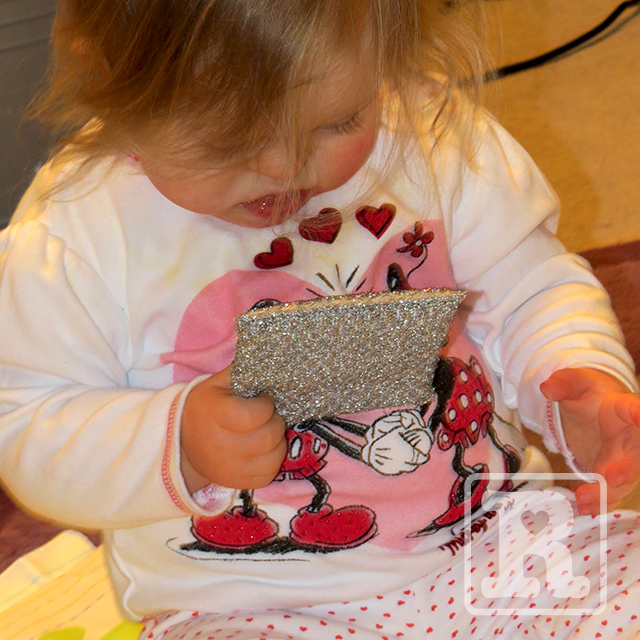 Finally, I have included a short video clip which provides evidence of our brilliant Bud becoming independently mobile. This is a remarkable step/shuffle for Rosie who has proven very lazy in her previous attempts to move, the only time of note was an attempted crawl backwards ages ago which she never did again plus the more recent encounter with the Christmas tree which also proved to be a one-off. This weekend however Rosie began to bounce a little at first and kept trying until the bounce became a shuffle and now there's no stopping her as she realises those items previously out of reach are now there for the taking! Your daughter is beautiful. My son also loved the giraffe toy! Fabulous post, Rosie really is coming on in leaps and bounds. The toys look great. One of Natty's faves back at that age were velcro hair curlers!!! What a lovely girl she looks! My daughter starting moving just like that and did the bottom shuffle for quite some time. It becomes very efficient after a while and avoids all potential 'falling down' issues associated with standing. Smart move! Awesome, reminds me of my little Ava (although shes not that little anymore)who is now 4, she did exactly the same bum shuffle, never bothered to crawl, just bum shuffled to where she wanted to be, then pulled herself up, which turned into little steps, now running around after her 2 year old sister.